Entirely made by hand in small batches by a master craftsman who takes prides in perfect design and blade material. 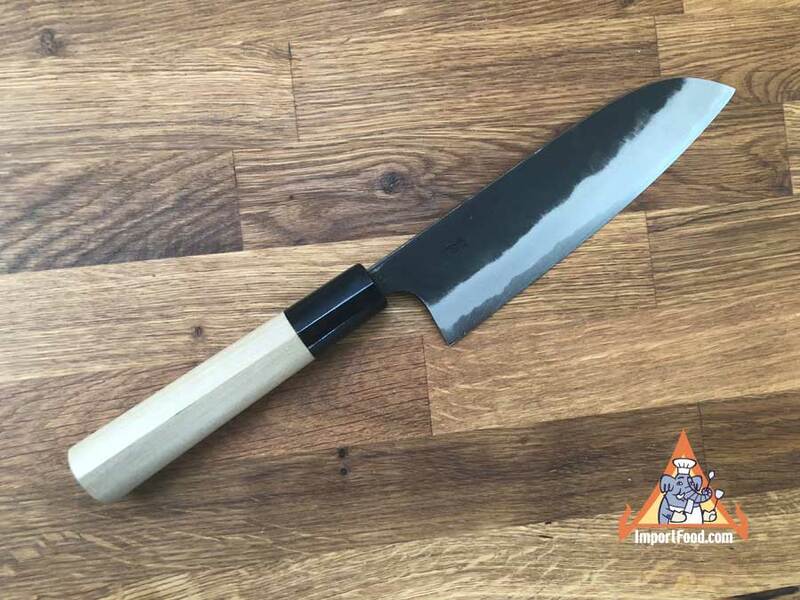 Our handmade Japanese knives are all individual works of art - starting at the hot forge where various elements are blended together to form extremely strong steel that holds a sharp edge for months of constant use. Blue Steel (so-called because of the blue paper wrapping the steel as it comes from the foundry in Japan) is extremely hard and must be crafted by hand rather than softer steel which is stamped by machinery. As you can see the steel is worked a special way to give it a natural black look, above the blade, this style is called 'black finishing'. The black area is less likely to rust and maintains the look for the life of the knife. The blade is made at a master's shop in Sakai, the area best known for making the finest knives of Japan. The finish work and final sharpening is done in Sakai. 'Stingray Tip' is stamped in Japanese on the blade. The handle, true magnolia wood from Japan, is later installed onto the blade by hand at a shop in nearby Osaka. The blade is 7" long, and handle is 5.5" long. Total length 12.5". The handle is round except for one ridge perfectly located on the upper right (as shown). This feels excellent in the hand and is popular with Japanese and western chefs. Every knife comes in a nice cardboard box fitted for the knife, and the blade is covered with a blue paper sleeve and foil kanji characters as shown below. The box top has the same kanji. You can also see a razor-sharp Japanese knife in action in our Fish Cleaning Video filmed in Tokyo. Hand crafted by a master knife maker and sold to you at a very reasonable price, as we purchased directly. Similar knives are sold in Tokyo shops and abroad for much higher prices. The knife is made of hard carbon steel, sharpened on both sides. Each unique knife is totally made by hand and we do not have many.